Earlier in the month I had some Mutsu apples from Justus Orchard in Hendersonville, NC. I'd been wanting to do something interesting, and along came the Daring Bakers Challenge. All it said was that I needed to make the crust recipe provided, in a tart mold, and then I could put pretty much anything I wanted to inside. 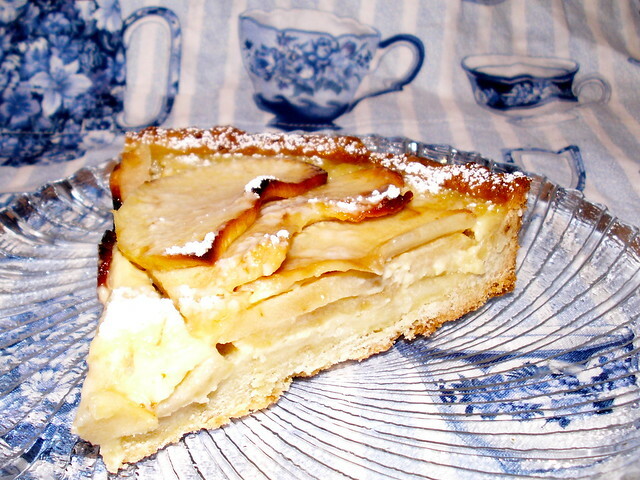 I kept finding recipes for Torta di Mele (Apple Tart in Italian!) but most of the recipes were in Italian too. 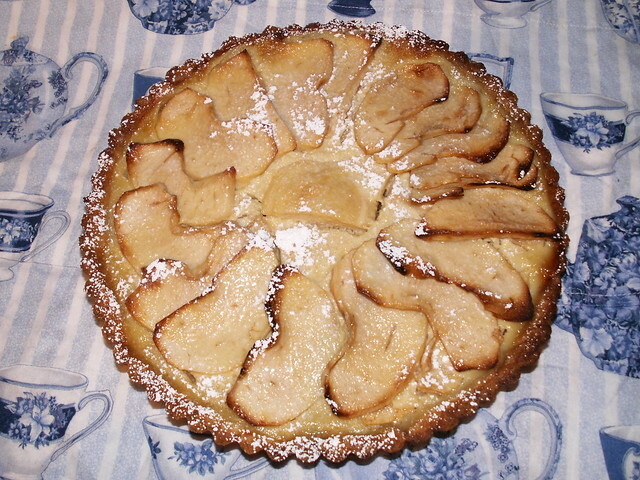 Along the way I kept running across recipes for Alsatian Apple Tarts that looked more along the lines of a crostata type tart - thinly sliced fruit, custard, and a rich crust. I ended up making Dorie's version since I had that cookbook at home, but used the challenge version of the crust. The recipe was a bit confusing, because I had way more apple than one layer's worth, and other pictures I'd seen of other versions seemed to have multiple layers. So against my instincts I added another layer. This meant the layer on top wasn't covered by the custard and had a much denser texture, and some of the edges browned, and it probably wasn't as picturesque as it could have been. Still, it tasted good! I was lucky to get a review copy of As Always, Julia: The Letters of Julia Child and Avis DeVoto, edited by Joan Reardon, through NetGalley. As if I needed to love Julia Child even more! But seriously, for people who are already fans, reading the letters between Julia and Avis will be a treat. Most of the letters are from the 1950s, when Julia was relocating frequently and working on what would become Mastering the Art of French Cooking, and Avis was smack in the middle of the politics and culture of New England. 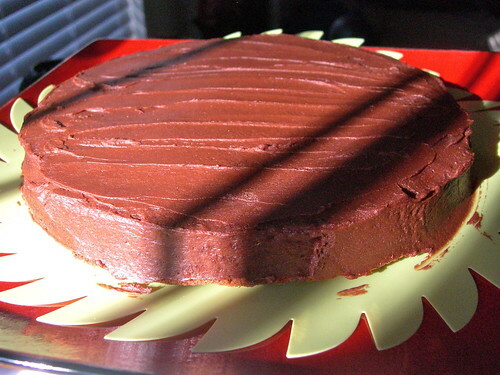 I was amazed yet again by the sheer number of times Julia would tweak each recipe, including the Reine de Saba, which I made two summers ago for my Julia Child party. I learned a lot, and laughed a lot. It comes out December 1. You can read my longer review here. Since we don't eat meat, I tend to plan something different every year for Thanksgiving. Last year was Native American food, 2006 was mushroom crepes, 2008 was peanut butter and jelly since we were on the road to a cruise in Florida. 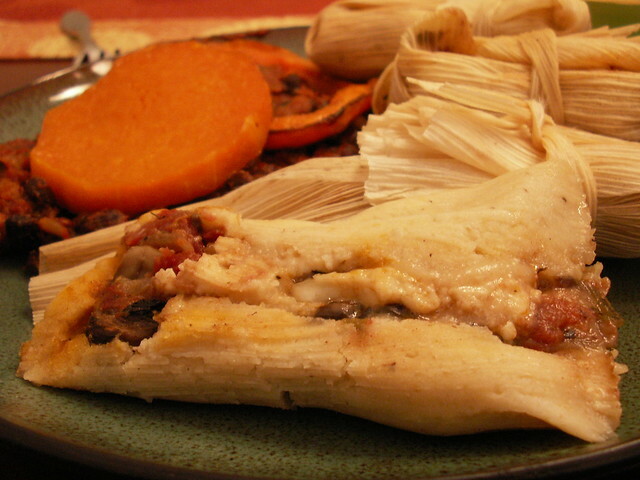 So what do you have for dessert with Mexican food? I had bookmarked a recipe for pumpkin pie flan, but I knew my in-laws were bringing a Deep-Dish Pumpkin Pecan Pie from Strossners. This baker couldn't NOT make a dessert on a holiday, however. 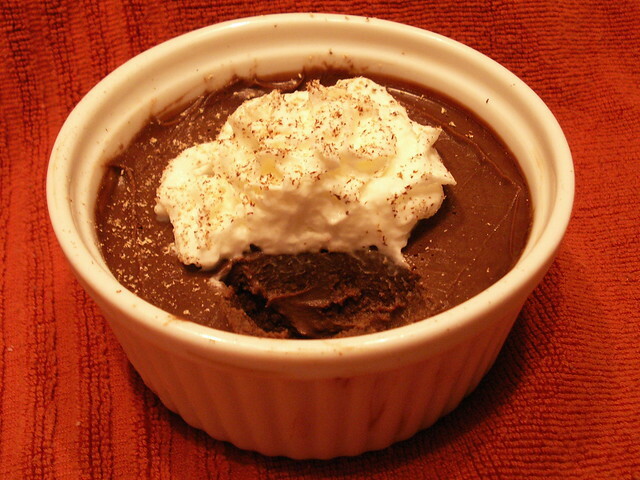 My alternate dessert was Mexican Chocolate Pots de Creme, a recipe from Stephanie Prida at FoodandWine.com. It was simple but so worth it! It takes the flavors of the chalky Mexican chocolate tablet and transforms it into a decadent, smooth dessert. I thought I had overcooked it, but after putting it through a sieve everything seemed just fine. 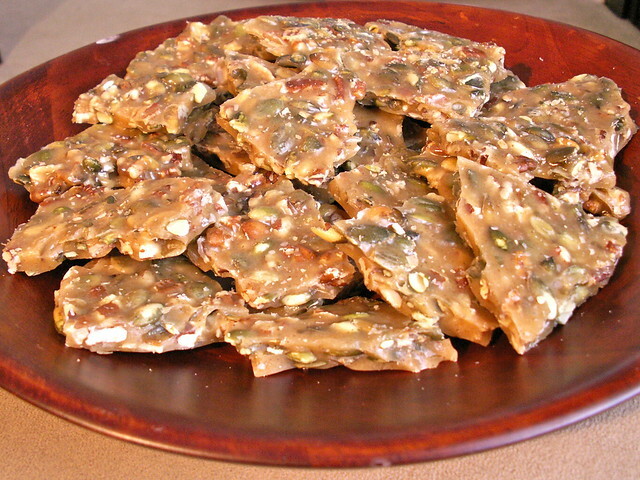 The other somewhat sweet recipe I made was Spicy Pumpkin Seed and Pecan Brittle, a recipe I picked up from SeriousEats.com. Although I figured out too late that I don't have an actual candy thermometer, merely a thermometer that goes up to 220, I guessed at the 300 and it turned out fine. This candy is an amazing combination of salty, sweet, spicy, and crunchy, and the flavors seemed perfect for this meal and for fall! In one of the recent Living Social deals in my city, they featured cupcakes by Cupcake Couture & Catering. This was a bakery I hadn't tried yet, so I took advantage of the deal. 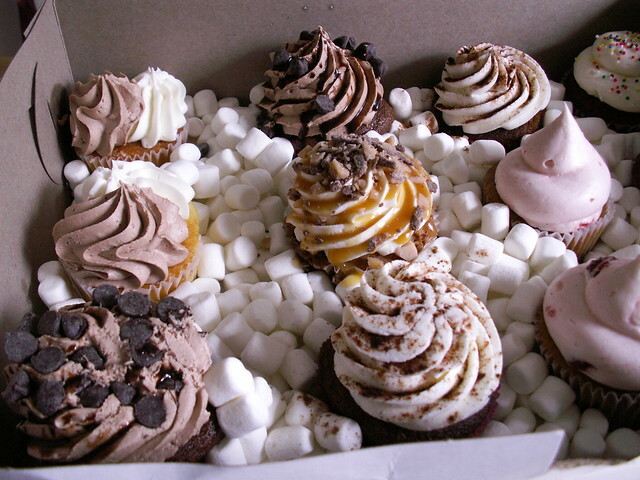 I picked up a box of dozen cupcakes, which were smartly packed in mini marshmallows so they wouldn't move around. We had strawberry, red velvet, coconut, butterfinger, marble, and a few other kinds. 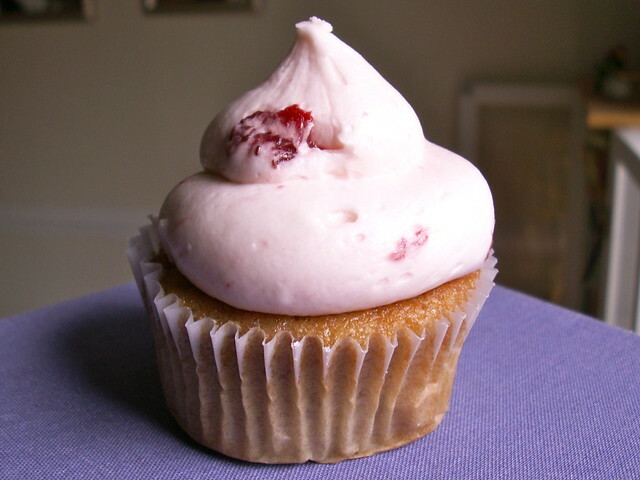 My favorite flavor was the double strawberry - both the cupcake and icing had a fresh strawberry flavor, nothing fake or cloying. I'm not sure I'd pay the full price for cupcakes there, but I think the cupcakes they sell just with icing are cuter than the ones with the awkward fondant cut-outs. That's a personal preference, of course. But I can tell they are using high-quality ingredients, because the flavors are good. Every time a new Harry Potter book or film comes out, I try to make treats to go along with it. In 2007, I made a fugly treacle tart and pumpkin pasties. Last summer I made a much cuter treacle tart (Harry's favorite) and cauldron cupcakes. 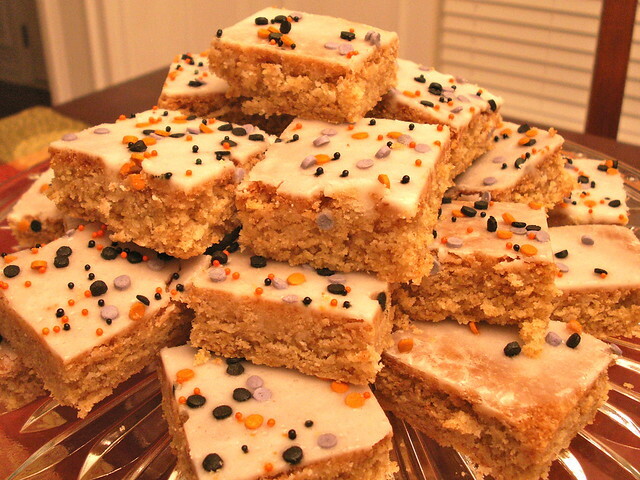 A few days ago, I saw a post on Nick Malgieri's blog for Lemon Ginger Squares To be honest, the flavor combination sounded a lot like what you end up getting from a treacle tart. I couldn't get it out of my head, so I have justified making it for Harry Potter Day by saying it sounds like something they could have served at Hogwarts. English-inspired desserts have more of an adult palate required, with ginger and lemon being very prominent in these bars. Since my local favorite grocery store does not have crystallized ginger on the shelf, I did leave it out. I'm sure it would have made these bars even tastier. Also I read the recipe wrong at first, so I added one stick of melted butter, then the egg and lemon, and THEN the other stick of melted butter. I probably need to make the recipe again, properly, to do it justice. But it is delicious, and an intense flavor for a little bar cookie. As we approach Thanksgiving, you might be pondering what to get the baker in your life. 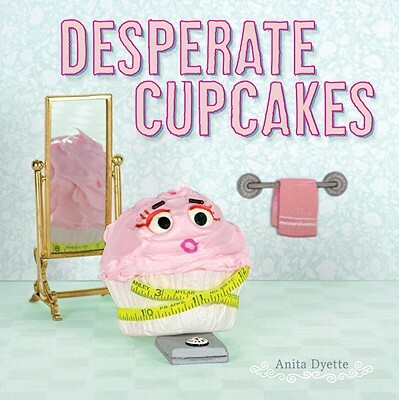 I recently got a copy of Desperate Cupcakes by Anita Dyette. I wasn't sure what to expect, but inside is page after page of silly cupcakes dressed up in their own scenes. There are zombie cupcakes, cupcakes in the park, cupcakes getting married, well, you get the picture. The artistry is impressive, but it is all for the sake of a giggle at these desperate cupcakes. 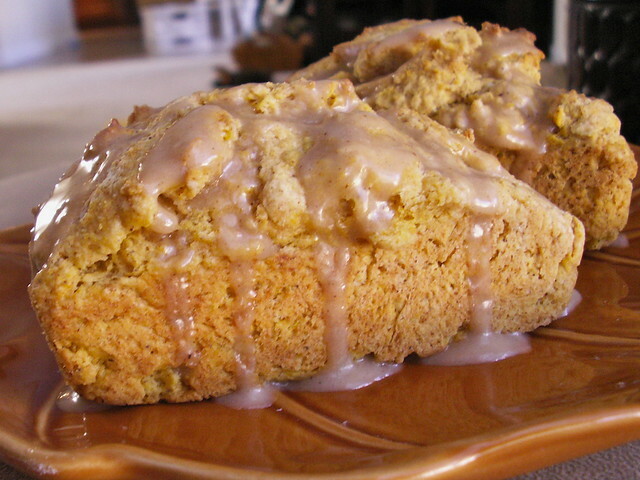 I didn't have a go-to recipe for pumpkin scones, so I literally picked the first hit from a Google search. I almost didn't use this recipe because it claimed to be a copy of the Starbucks scone recipe, and I find Starbucks scones to be dry and tasteless, depending on an overload of glaze for some semblance of freshness. But knowing that most recipes that claim to be copies usually aren't, I chanced it. A lot of the reviewers suggested doubling up on the spices, only using the spice glaze instead of the original overkill of two, and adding vanilla to the one glaze. I followed all of their advice, and they didn't steer me wrong. These were delicious and tender. The egg in the batter makes for a nice density, and the pumpkin replaces most of what would normally be heavy cream, making these quite a bit lower in fat than the usual (although there is still a hefty amount of butter, so don't get carried away and call them lowfat). We had these for breakfast this morning with the Rainforest Alliance Certified Guatemala coffee from The Brown Bean in Brevard, NC, which we ground fresh and brewed with freshly ground nutmeg. No matter what your beliefs - tea parties are for scones and cute little sandwiches. I urge you to plan your own tea party on Thursday, January 20, 2011. Because tea parties should be delicious!